The Vegan Magpie: Greenbay Supermarket Free Shipping offer! Greenbay Supermarket Free Shipping offer! Hello! 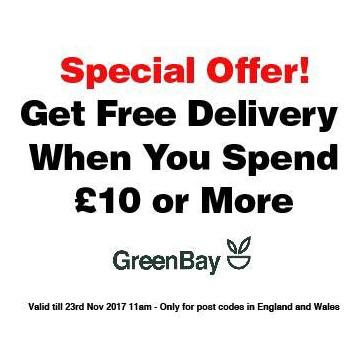 Super vegan supermarket Greenbay are running a limited time offer of free shipping for all online orders over £10! Woohoo! This offer is available until 23rd November at 11am, for postcodes in England and Wales. Greenbay offer a great variety of products at nicely comparable prices, including Schlagfix creams, Mozzarisella, Sgaia, Follow Your Heart, just loads of goods. I'm literally typing in each brand I think of and they sell it so far! Freedom Mallows on Offer at Sainsbury's! Bulldog Skincare on offer in Boots! White Rabbit Skincare Black Friday offer! Vegan Womble Black Friday sale! Ms Cupcake's 2nd Black Friday offer! Nakd and Trek Black Friday offer! Ms Cupcake Black Friday Offer! Body Shop Black Friday Sale! Linda McCartney sausages on offer in Tesco! Sainsbury's now sell Freedom Mallows! Love Seitan half block offer!